First Team's FURY portable goal, pictured here with an acrylic backboard, is just one of the options you'll find in First Team's full-color catalog. A variety of backboard options are available on the FURY. In addition to portability, First Team portable goals also offer ease of height adjustment. A simple hand-crank mechanism on the FURY system allows you to lower the basket height from 10 feet to 6-1/2 feet. This is useful for moving the goal into storage and executing drills for younger players during camps or youth programs. The FURY is an effective portable goal for schools, churches or residential use. Do you need an automatic batting cage that can be used by kids and adults for both baseball and softball? ATEC AR Batting Dual Cages include two machines for baseball and softball players. The Raise-Lower system provides the batter the opportunity to raise or lower the pitch in the strike zone for training or to accommodate players of different ages and sizes. The location can be changed by the batter at the hitting station for both right- and left-handed hitters. If you're planning a course for professional Disc Golf tournament play or if you just want one of the best, the Mach III is a top choice of touring professionals. Most easily identifiable by the prominent number plate, the Mach III is considered a Cadillac® of disc-catching equipment. The Mach III is one of the top disc-catching devices available in the industry and is among the most widely used catching devices found on PDGA-approved courses. DGA® is a leading manufacturer of Disc Golf catching equipment and one of the companies that started the sport more than 30 years ago. Jaypro Sports offers one of the safest and most innovative soccer goals ever designed. This rugged, official-size, folding goal offers great stability, portability and outstanding safety features. It sets up and folds down in minutes. The goal is also available as a round. Manage your players and your space with NetworKs. NetworKs catches and collects volleyballs so you don't waste valuable training time gathering volleyballs. 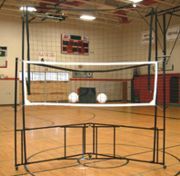 The front net is 10 feet wide and adjustable from a height of 6 feet to 9 feet for all age and skill levels, from beginners to the USAV. Practice hitting, serving, setting or passing into NetworKs. Use it during the season for an extra training station or for an off-season training session. The unit is effective for team and individual use, and it easily collapses without use of tools. It stores as 78 inches by 18 inches by 74 inches. 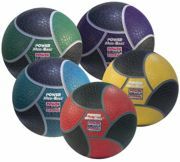 Enhance fitness and athletic performance and spice up routine medicine-ball workouts using the new, exclusively designed Power Systems medicine balls. These perfectly balanced, textured med balls can be used to perform squats, lunges, abdominal crunches, explosive tosses and other exercises to train the entire body. These all-rubber med balls are durable, weather-resistant and retain their round shape. Color-coded by weight, they are available in two to 12 pounds in two-pound increments, as well as 15, 18, 20, 25 and 30 pounds. Diameter ranges from 8 to 11 inches. A Power Med-Ball instructional manual, VHS and DVD also are available. WaterBoy Sports, "The Leader in Sports and Industrial Hydration," features the Vertical Power Model W/Tank (#VPM-T). It comes with six drinking stations and a 20-gallon tank, and it uses WBS portable Power Pac retractable hoses for easy use, and it doesn't leak when tilted. 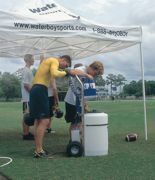 WaterBoy Sports designs its product line with certain criteria that insure high- and consistent-quality levels. This quality level allows the product line to endure the test of time and offers the best possible service to the target market. All WBS products are designed to facilitate both the athlete and the athletic trainer. Douglas is a manufacturer of sport nets and equipment for a variety of sports including tennis, baseball, soccer, volleyball, basketball, hockey, golf and pool sports. A brief summary of the product line includes tennis nets and posts, backdrop curtains, gym dividers, custom netting, protective padding, adjustable basketball systems, volleyball posts and nets, baseball and softball products, windscreens, soccer goals, multi-sport courts, and much more. With more than 30 years of performance, Douglas is dedicated to fulfilling your sport equipment needs.